Test the firmness and extrusion properties on your fruit or vegetables. There are many factors that affect the texture of fruit and vegetables. The time of harvest and storage conditions have an effect on the rate of softening. Texture analysis can help determine the physical properties of fruit and vegetables, and how they change during ripening. 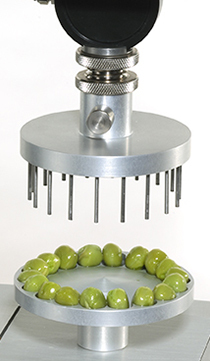 Firmness of whole fruits/vegetables and extrusion properties of soft fruits, peas, beans, corn and processed fruit/vegetables are just a few of the test types you can perform when combining the TA1 texture analyzer with our food grips and fixtures for fruit and vegetables.